Synopsis:She has a destiny so great that even the gods fear her. After living through an attack from her worst nightmare, she awakens to find herself far from home, surrounded by glorious riches and servants Ö and a few demigods who enjoy killing things. Upon learning that her favorite rockstar is an Olympian god, she is thrust into her new life as the Oracle of Delphi, the prophesier of the future, and the great Pythia that the gods have been anxiously awaiting to arrive for centuries. Setting out to fulfill the prophecy she has been given and to keep her family safe from a demigod Princess that wants her dead, Chloe learns of how great she is to become, all the while fighting mythical monsters, evading divine assassins and trying to outwit the ever-cunning Greek gods who harbor secrets of their own. In the hopes of discovering the Most Beautiful and the truth of her destiny, she strives to uncover the mysteries of the demigod Prince who has sworn to protect her with his life Ö and threatens to win her heart in the process. In order to build some buzz for the second book of the Oracle of Delphi series, help us spread the word about the first book in the series, Prophecy of the Most Beautiful . This can best be done if you have a blog, especially a blog about books. If you are a blog tour host with The Masquerade Crew, your invitation to help Diantha will be sent to you soon (if you don’t already have it). If you aren’t a tour host for The Masquerade Crew yet, go to THIS PAGE to sign up. If you don’t have a blog, you can still help. Spread the word via Twitter and Facebook and anywhere else you hang out online. There’s a giveaway mentioned below that will give you the opportunity not only to win a copy of the first book but also spread the word via Twitter. 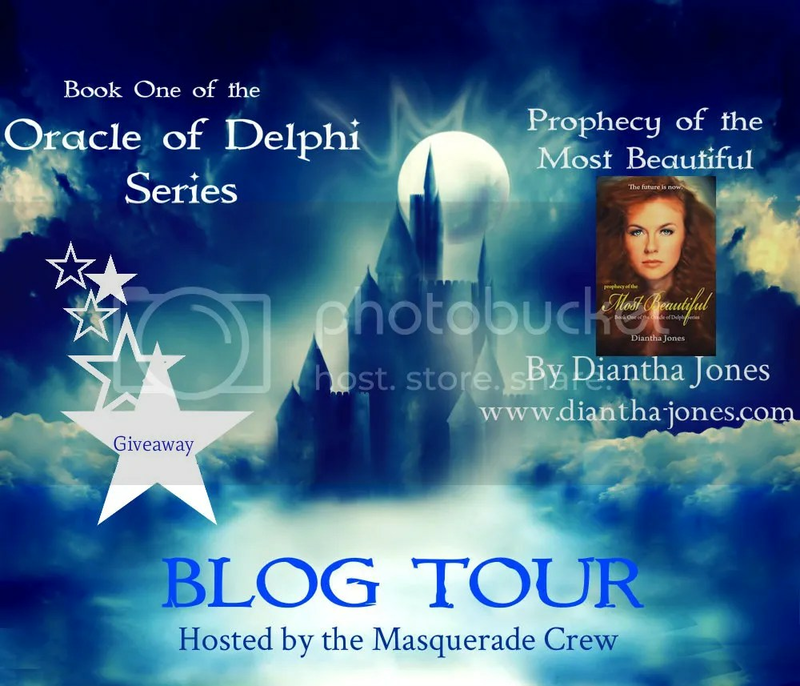 Diantha Jones and The Masquerade Crew are giving away 3 copies of her first book, Prophecy of the Most Beautiful . Enter for your chance to win. Click HERE to go to the giveaway form.